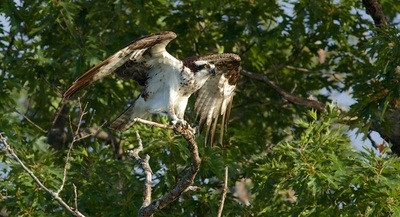 The Preserve's Osprey is often sighted along the shoreline between Frautschi Point and Picnic Point, surveying the lake from a dead branch high up in the trees. 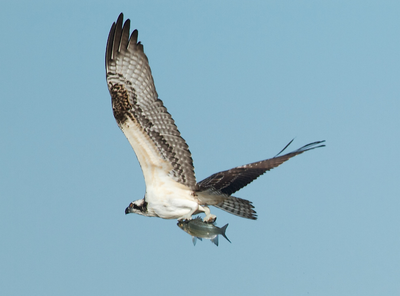 As the fishermen in the area below, the Osprey knows the best spots for catching fish. The Osprey can also be spotted from the path along the shoreline and the top of the Biocore Prairie, but his magnificent appearance and flight are most impressive from the water side. Three experts weighed in on what species of fish the osprey was carrying in the photo by Arlene Koziol on the lower left. Pete MacIntyre, Red Bier, and John Magnuson report: "We think that the fish is probably a walleye. Ted's comments sum it up. "It is definitely NOT a primitive fish, but is likely in the family, Percidae. The pelvic fins are forward and the pectoral fins are on the side; pinned to the body. The white belly, robust body, flailed gills, and squared pelvic fins point me strait to walleye." 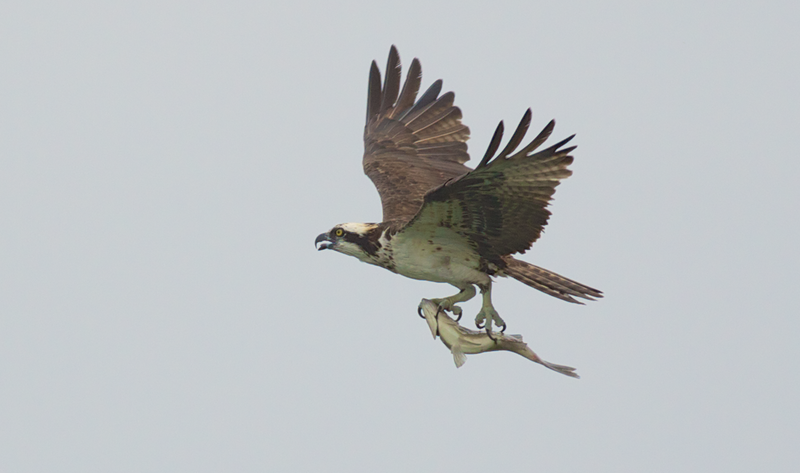 Arlene's photos of the Osprey, as well as other bird images she has captured, tell a story of survival. 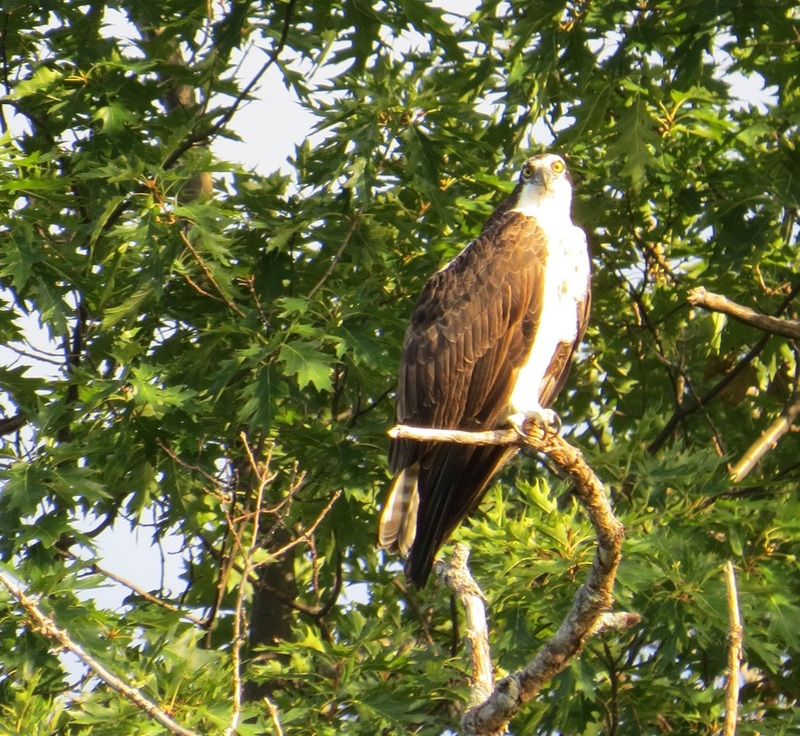 The Osprey has "turned the corner," she would say. 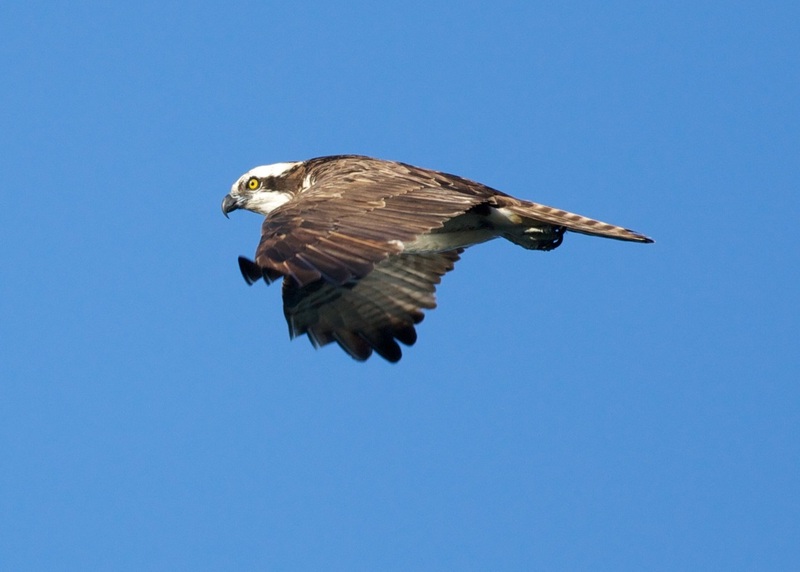 "North American Ospreys gained increased recognition during the 1950s–1970s because populations in several key regions crashed. About 90% of the pairs nesting along the coast between New York City and Boston, for example, disappeared during this period; Chesapeake Bay lost about half its breeders; Great Lakes populations also suffered major declines. Studies showed high levels of contaminants (especially DDT and its derivatives) in eggs, severe eggshell-thinning, and poor hatching success. 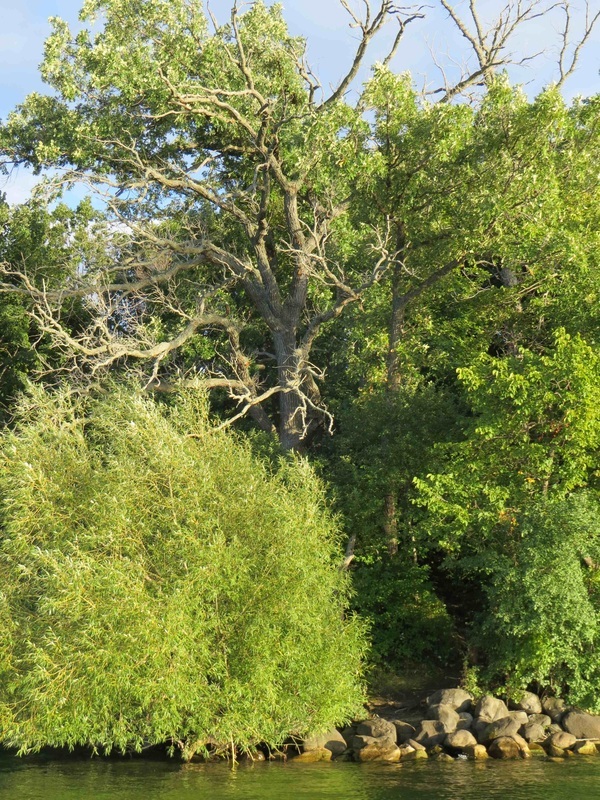 Mortality of adults may have contributed to the decline. 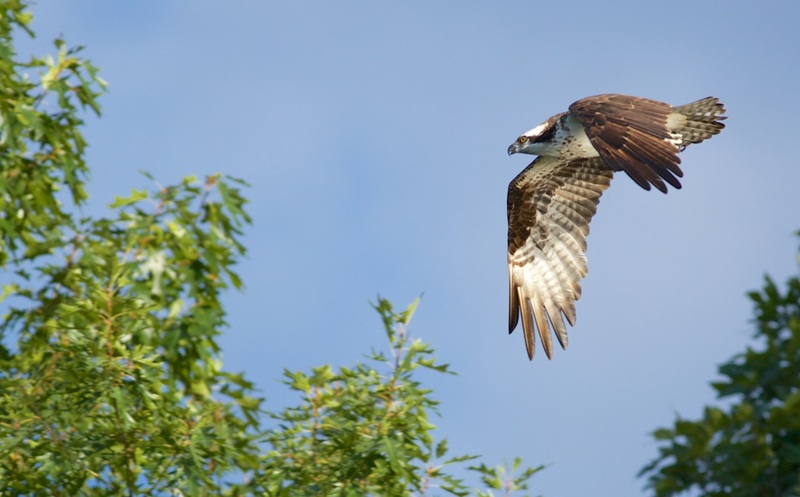 Osprey studies provided key evidence in court to help block continued use of persistent pesticides, and Osprey populations recovered rapidly thereafter. Although small pockets of contamination remain, apparently mostly on wintering grounds, by the year 2000 many U.S. and Canadian populations were approaching historical numbers, boosted by a cleaner environment, by increasingly available artificial nest sites, and by this bird’s ability to tolerate human activity near its nests. Phoenix-like, the Osprey has arisen from the ashes of its own demise, a survivor, even a backyard bird in some areas; little wonder the species has become such a powerful totem for conservationists. Quoted from: Osprey-Birds of North America Online, Issue No. 683. Authors: Poole, Alan F., Rob O. Bierregaard, and Mark S. Martell.